Tender, sweet asparagus stalks are about as springy as it gets, but their tough, fibrous ends have to be removed before they can take their place at the table. These are usually tossed (or composted), but they can actually be used to make little green soufflés. 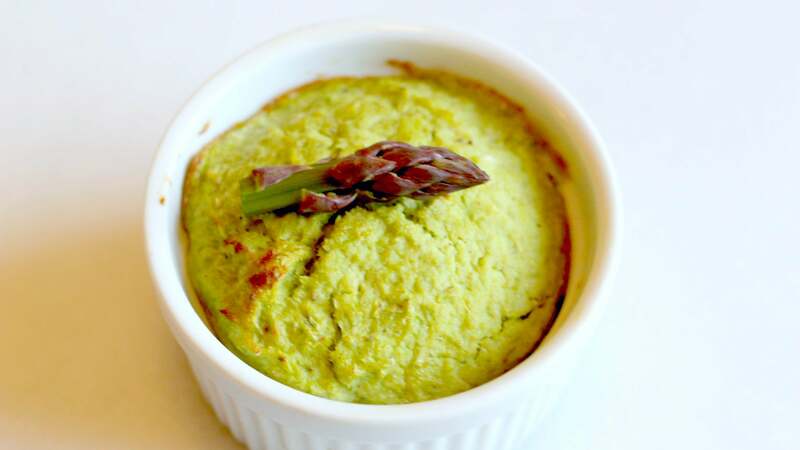 Asparagus soufflé - or "asparagus mousse" as The Old Farmer's Almanac calls it - isn't a new concept, but it is a perfect use for the tough end of the stalks. Cooking the heck out of them, giving them a whirr in a high-speed blender or food processor, and then baking them into tender little soufflés renders them delightful. Another bonus is that this recipe from The Old Farmer's Almanac is fairly forgiving. They recommend a pound (about 450g) of asparagus matter, but I made two with 225g of ends and the same amount of eggs, and they turned out just fine. Also, you don't have to stick to their recommended seasoning. Tarragon and nutmeg are great options, but you can also add garlic powder, onion powder, curry powder or cheese (not powdered). Cook the asparagus until it is very tender. How you cook it is up to you. You can sauté, blanch or bake, just get those ends past "tender crisp". Blot any moisture or oil with paper towels, then process the butts in either a blender or food processor until they are as smooth as you can get them. Add egg yolks one at a time, and blend until smooth. Add seasonings (not cheese) and blend once more. You can run the mixture through a sieve if you want it super smooth, but you don't have to; I kind of like the crunchy little bits that make it through. Whip your egg whites until stiff peaks form, then fold them into the asparagus and yolk mixture, along with the cheese. Pour the batter into very buttery, greased ramekins, and bake at 177C for 25-30 minutes, until a knife inserted into the middle comes out clean. Garnish with asparagus tips if you have them, and serve immediately.